TTB COLAs Online Done Fast! Importing alcoholic drinks from another country into the U.S. or creating your own alcoholic product within the US can be a profitable business. However, because Alcohol is a regulated substance you must pay attention to strict U.S. Government TTB labeling standards that must be met before your product is shipped from the foreign country. If these standards and practices are not followed to the letter, your shipment of foreign Wine, Beer, or Distilled Spirits drinks can be delayed, confiscated and even destroyed. These regulation also apply to domestic products (created within the US) as improper labeling will not be accepted by distributors and can lead to fines and suspension of manufacturing privileges. You might think that having the right label is just a matter of translating the original label into English. However, this is barely one part of the process. Not meeting the other criteria can lead to your shipment being stopped at the border and barred from entering the US. 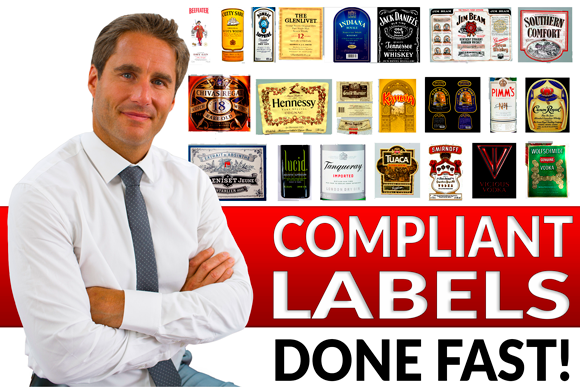 Our Alcohol Compliance Label Experts at Rezzonator Services are here to assist you early on in the process to avoid having problems and spending thousands of dollars and valuable time printing incorrect labels. Label requirements and compliance can be complicated. All alcoholic beverage labels must have the proper "Government Warning", which must be formatted within very specific parameters (from font to size, to placement and precise wording) and must be tailored to your specific bottle and beverage type. All labels must also contain a description of your alcoholic drink that must match the current Government definitions for Beer, Wine, or Distilled Spirit. In many cases, your product may fall under multiple descriptions. It is extremely important to choose the right description for your product to avoid disapproval of your registration, or in some cases a higher tax rate. You must be very careful to not use certain wording that is not allowed on labels that enter the U.S. In many cases, descriptions on beverages coming from another country may include words that would cause delays on your label approval. 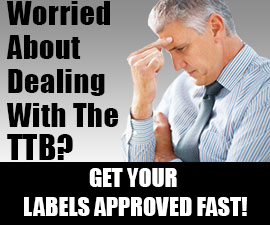 Having the Rezzonator Services Labeling Team on your side will give you access to an experienced representative that will guide you and ensure that your label has all of the right information for TTB label approval. Generally, there are two main ways to bring a label to market. You may start with a pre-existing label (which is common for already established foreign brands entering the U.S) or you may choose to design your own. When dealing with a pre-existing label, we understand that you may want to keep a lot of the elements on the label that make it recognizable to the public and the market. After all, you do not want to change your one of your most valuable assets which is product recognition. With this in mind, we can ensure that the necessary compliance items appear on your label without compromising the existing design. Alternatively, if you are creating a new product, Rezzonator Services can assist you with the design of your label so that not only does it stand out on the market (on the shelf) but it is also compliant while keeping your vision in mind. There are also exclusivity agreements that can be used to secure your market pending on your specific situation. We specialize in exclusivity agreements. Call us with your situation for specifics. You'll also need to provide formulas for your drinks. Things like Flavors, Ingredients and Methods of preparation must be provided. Depending on your product you may also need Lab Reports on your particular import. Our experts can get your formulas approved quickly. A brand name is considered a trademark. It includes the words (title), a symbol, device or any combination thereof. It is used to distinguish your brand from other brands on the market and it tells the customer the source of the product. Unique alcoholic drinks that must be protected from competition should be trademarked. We specialize in trademarking alcoholic beverages. While others can talk a good game, only Rezzonator Services stands behind our paperwork with a 100% Money Back Guarantee. Call and ask about our guarantee and why working with us is the smart thing to do. Remember that the more info you give us the more we will be able to help you. To cut down on spam, please answer the following questions: How much is 5 - 3?